These little dresses are made in a variety of ways. 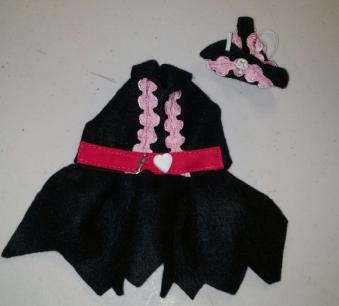 THIS ONE is a Valentine's Day Pirate Dress has 'jagged' hem line, a darling white heart on the red belt next to the little bitty DAGGER! The Matching Captain's Hat has a Skull Bead. The item you are looking at was hand crafted in our SD USA non smoking home and IS READY TO SHIP. 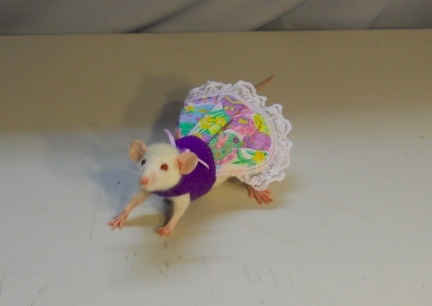 You can see in this and other of our MANY photos of ratties dressed on our website that our clothing will not only be fast and easy to put on your rattie, but it will be comfortable for your ratties to wear. Our rattie clothing was FIRST DESIGNED FOR OUR OWN RATTIES. I have carried ratties around wearing clothing for hours on my shoulders. The waist measurement on this Dress is approx 8", it does have a bit of stretch in it, and the outfit is approx 5" from neck to tail. PLEASE KEEP SHOPPING. WE ONLY CHARGE SHIPPING ON ONE ITEM. ALL ITEMS SHIPPED TOGETHER ARE ONLY CHARGED ONE SHIPPING CHARGE.